These lever back knot earrings from Apples of Gold Jewelry feature an 8mm knot as the main design, and have quite the amazing amount of detail put into each one. The 14K yellow gold earrings feature a lever back design that add a little extra character to them, instead of being a traditional back. The warm yellow gold of the earrings add an extra touch of sweetness to the design, and you can be sure you are getting a high quality jewelry item! 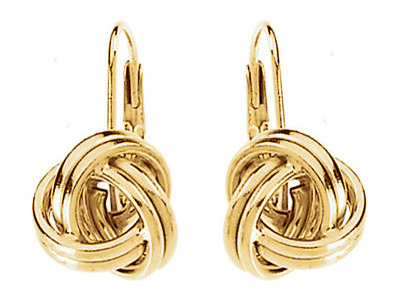 We guarantee our Lever-Back Knot Earrings, 14K Gold to be high quality, authentic jewelry, as described above.